Product prices and availability are accurate as of 2019-04-24 15:04:24 UTC and are subject to change. Any price and availability information displayed on http://www.amazon.com/ at the time of purchase will apply to the purchase of this product. Tired of sticking everyday to the same color code? Looking for a perfect match to your nonblack wardrobe? This belt is the answer for you! Our quality crafted genuine leather belts are now available in Black, Brown, Whiskey, Wine and Tan to best match your attire. For that everyday clean look, or when attending a business meeting, this Sportoli belt will do. 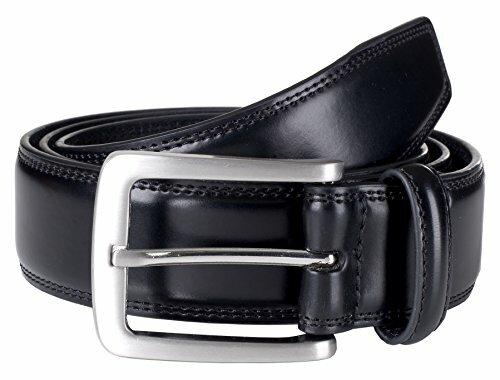 Its genuine leather composition, fine double edge stitching, and a durable metal buckle affirm belt's great quality. Size and Fitting: Available in sizes 32 to 56. These belts have 5 holes to allow adjustability for your best comfort. Measure your waist, or even simpler, get your pants size and choose a belt that is at least 2" longer than your pants/waist size (referred to as: One Size Up). For example, if you wear a size 34 pants, you would order a belt size 36 (in case of an odd size such as 35, go with 3 inches more bringing you to choose a size 38 belt). Width of belt measures 1 1/4". 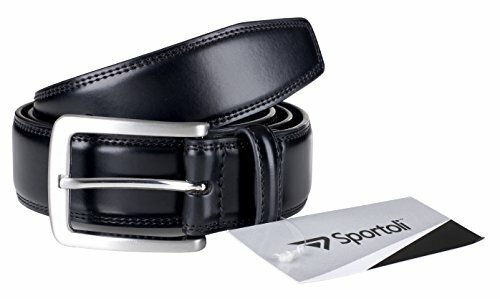 Check out Amazon's Sportoli Store for our entire belt collection as well as other great Sportoli products to complement your outfit.